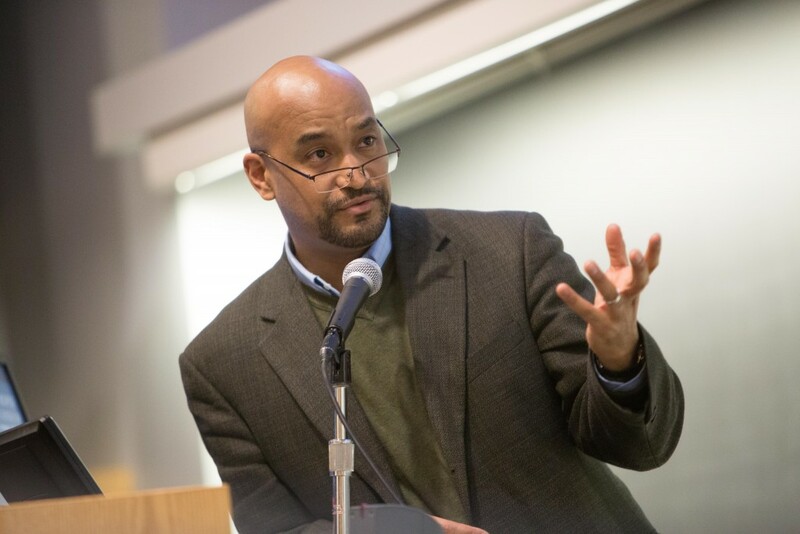 The first public program in the Talking Publicly series sponsored by the University Libraries (in partnership with the Reed College of Media) was launched on March 4, 2015 at 7:30pm at Ming Hsieh Hall on the Downtown Campus of West Virginia University. Winter storm Thor prevented delivery of both parts of the two part program on the gender gap in Wikipedia. The Thursday morning workshop on writing for Wikipedia will be rescheduled at another time. In spite of the dreadful weather, we were successful with part 1 which was the panel discussion “Where Are All the Women?” on Wednesday March 4 at 7:30pm. Maryanne Reed, Dean of the Reed College of Media, opened the program and Jon Cawthorne, Dean of the WVU Libraries, moderated. Maryanne Reed, Dean of the Reed College of Media, introduces the program. Dr. Jon Cawthorne moderated the panel. The entire program was dedicated to the memory of Dr. Adrianne Wadewitz who was a pioneer Wikipedian who addressed the gender gap in the online encyclopedia by writing high quality content on women and women’s issues for almost ten years. Dr. Adeline Koh responds to a question from the audience. Panelists included two members of the staff at Wiki Education Foundation in San Francisco: Frank Schulenburg, Executive Director of the Wiki Education Foundation and Jamie Mathewson, the Educational Partnerships Manager at the Foundation. Sydney Poore, a Wikipedian at the Cochrane Collaboration, (an international not-for-profit organization preparing, maintaining and promoting the accessibility of systematic reviews of the effects of health care) and Dr. Adeline Koh, Associate Professor at Stockton University and founder of the Re-Writing Wikipedia Project were the other panel members. 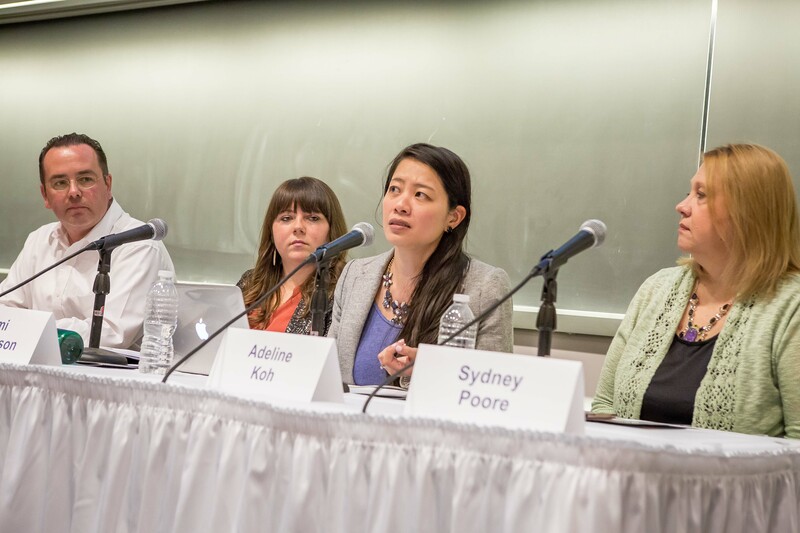 The presentation webcast is available here: https://tlcommons.wvu.edu/webcasts The Twitter conversation was storified by one of the four panelists, Dr. Adeline Koh. There were almost 100 in the audience that evening and 35 more tuned in to the live streamed webcast. The Reed College of Media students at work, live blogging at the event. Five students from the Reed College of Media blogged during the event and monitored the Twitter feed. Three focused on the live blog and two others focused on Twitter. The students are members of the WVU Chapter of the Radio Television Digital News Association (RTDNA). 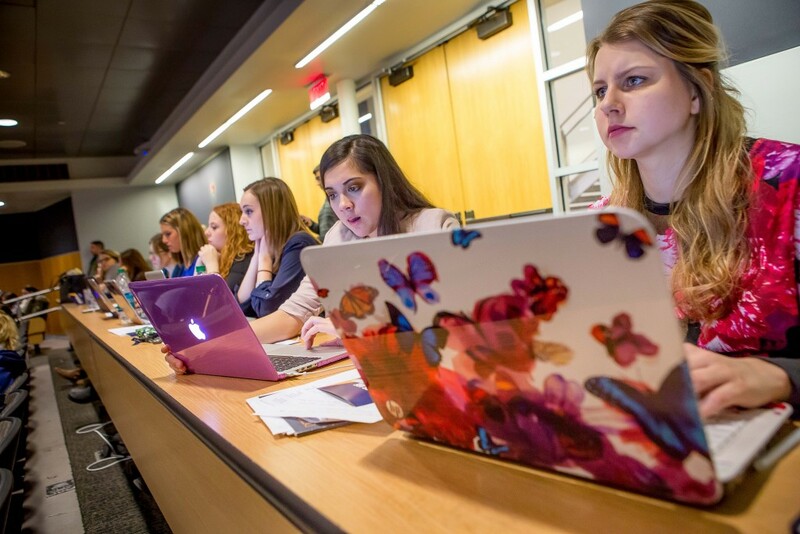 RTDNA is a national professional organization, and the WVU chapter is one of several college chapters across the country. Emily Corio is the faculty advisor for the club at WVU. The students who participated were Caroline Peters, Kiley Putnam, Callie Clendenin, Devon Kelly, and Anney Mierski. Jami Mathewson responds to one of the moderator’s questions. 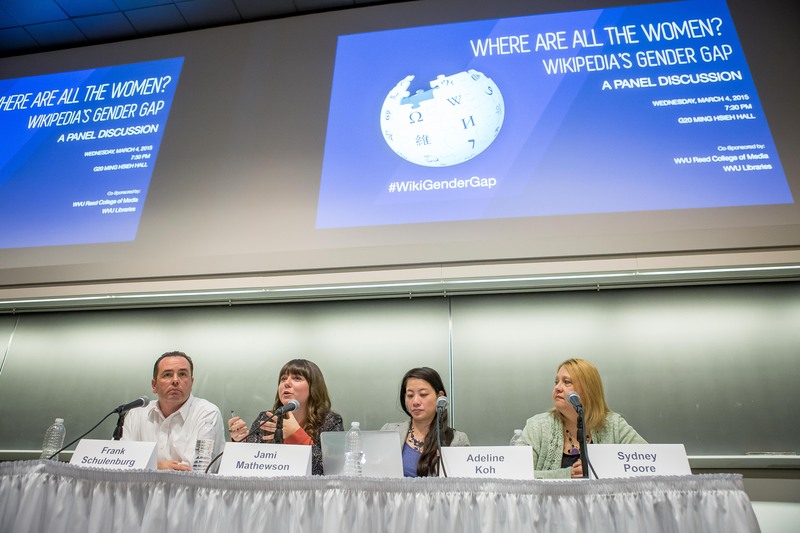 Panelists responded to Dr. Cawthorne’s questions including: Why should we care about the gender gap in Wikipedia? Could you share some examples of the lack of balance in Wikipedia content? What is being done to address and change the content imbalance? 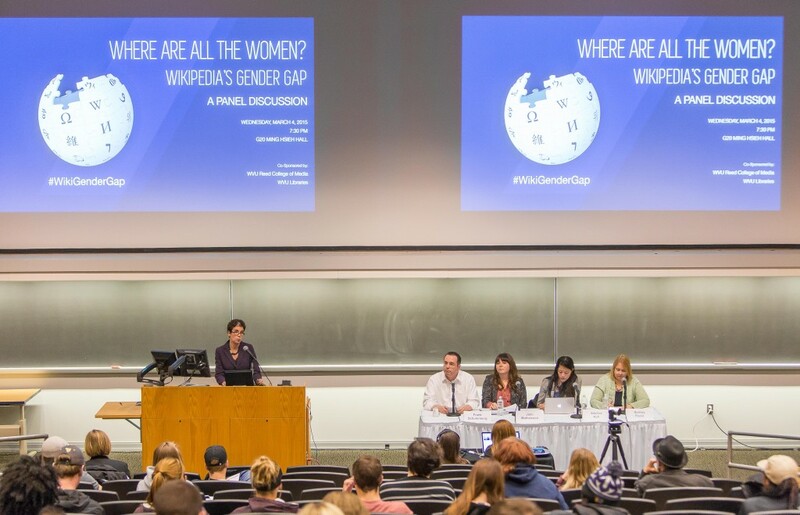 What can faculty and students do to address the gender gap in Wikipedia? Is there also a diversity gap in Wikipedia? Why did the Libraries, in collaboration with the Reed College of Media, produce this program? The WVU Libraries have a strong interest in good quality information that is accessible to everyone. We know that Wikipedia is consulted daily by millions of people worldwide, so improving balanced and neutral overall coverage in Wikipedia is a matter of public good. Achieving gender and diversity equity in the subjects covered is a goal for us all. This program promoted greater public awareness about the problem and we hope some participants will become Wikipedians to work on solutions through content development. Overall the Libraries’’ symposium series “Talking Publicly: Conversations for a Better World” aims to sponsor thoughtful public conversations about important issues in civic life. The Libraries are challenging themselves and others to connect with the multifaceted issues of contemporary society.